Until recently, I wasn’t much of a fan of beef stew. I’ve eaten it at plenty of potlucks + in restaurants, + as much I wanted to like it, I’d never been all that impressed. However, with the weather getting downright cold this past week, I challenged myself to make a beef stew that would knock my beef-stew-skeptical socks off. I searched for the perfect recipe, eventually running across one, with, oh yeah, two cups of red wine in there. Sounds right up my alley, doesn’t it? I gathered up all the ingredients, + got stewin’. After smelling it cooking for over three hours, I couldn’t wait to try it. And after eating it, I have excellent news to share: I have finally met the perfect beef stew!! The wine lends delicious rich notes to the stew, while the yukon gold potatoes, red bliss potatoes, + carrots add delightful flavor + texture. And the meat? Simply divine. It is wonderfully rich, bursting with flavor, + truly fall-apart tender. I served this stew with a fresh baguette + red wine, + it was seriously the perfect cold-weather dinner. So, whether you’re already a big fan of beef stew, or if you’re still a skeptic who needs a bit of convincing, you’ve gotta give this recipe a try. I bet that you will absolutely love it! season the meat with salt + pepper, place in a large bowl, + toss with the flour. heat the oil in a large dutch oven or wide-bottomed pot with a tight-fitting lid over medium-high heat. cook the meat, in batches, until well browned on all sides, 6-8 minutes, transferring the pieces to a plate as they are browned. pour off + discard any drippings from the pot. add the tomato paste, wine, broth, onion, bay leaves, thyme, + 2 of the carrots + bring to a boil. return the meat + any juices back to the pot (the meat should be barely submerged in liquid), cover, + transfer to the oven. cook for 2 hours. using tongs, remove + discard the cooked vegetables. add the potatoes + the remaining 8 carrots to the pot, cover, + return to the oven. cook until the meat + vegetables are fork-tender, about 60-75 minutes more. This looks delicious. I thought of some other modifications that might also be delicious! Thanks for the inspiration! I am definitely one of those skeptics that needs convincing when it comes to beef stew. I may need to try this one. you definitely should. i was truly never a fan until this version + i couldn’t get enough of it. i had some of the leftovers for lunch yesterday + they were even better than the first day. I’m with ya–never been a huge beef stew fan (though my husband is), but I think I can be easily swayed with the red wine! This looks like a recipe I can get on board with…I’ll be adding this to our fall menu for sure. wine makes everything better, doesn’t it? can’t wait to hear how this turns out for you — i think both you + the hubby will love it! it’s super delicious – it’s still calling my name even now that it’s been a few days since i made it! bahaha! you’re a poet + i didn’t even know it. and i agree! oh you are too much. I’ve never seen beef look so appetizing! looks yummy!! i’m going to have to make this. I can already visualize myself eating it with some crusty french bread and washing it down with the leftover wine:) thanks for sharing the recipe. that’s exactly how we ate it, too + it was just perfection. hope it turns out fabulous for you! I would eat your stew Amy, but I too didn’t used to be much of a stew eater! Growing up, my mom used to make huge batches of stew and freeze it, so we had it a LOT for dinner. I used to pick out all the potatoes and eat just those. Can’t wait to try your recipe. I mean, how can you go wrong with 2 cups of red wine??? Oh I agree. I always hated stew growing up and I’m not not a huge fan of it. However, I do love Beef Bourguignon, and this recipe sounds somewhat similar. AND if you are saying I need to try it, maybe I just will!!!! it is definitely similar to beef bourguignon in it’s flavor + texture. hope you give it a try + love it — it converted me! Hey guess what we’re having for dinner tonight? I just put it in the oven a bit ago I typically use my Nana’s old recipe, but the red wine this recipe offers was talkin’ to me. Thanks for sharing the recipe Amy! Amy this looks great, especially for the holidays! this looks FABULOUS–perfect for the cool temperature hitting us later this week! that’s my favorite part of the fall – getting all the great, comfort food stew + soup recipes out of hibernation! For a late comer to the stew scene, it sure seems like you hit it out of the park on your first attempt! Looks delicious. thanks, elizabeth. when i saw 2 cups o’ wine in there, i was pretty sure that it was a stew + Amy match made in heaven + luckily, i was right! pretty sure we would love this. I made Barefoot Contessa’s Beef Burgundy last Sunday for dinner and it was incredible. Full of red wine and broth and beef and mushrooms…so, so good. mm, i’ll have to look that recipe up – i’ve never made a barefoot contessa recipe that wasn’t absolutely fantastic! Thumbs up on the beef stew! I have loved it all my life. My dad made it with a pressure cooker and I will have to get one soon so I can make his recipe. Until then I know I will have to try yours – red wine in it sealed the deal. Looks amazing. Beef Stew is one of my favorite fall/winter comfort foods. that’s definitely one of my favorite things about fall + winter — the awesome comfort foods! Have mine going right now but trying it in the crock pot! yay! can’t wait to hear how it turns out, especially using your crock pot. This turned out great in the crock pot! 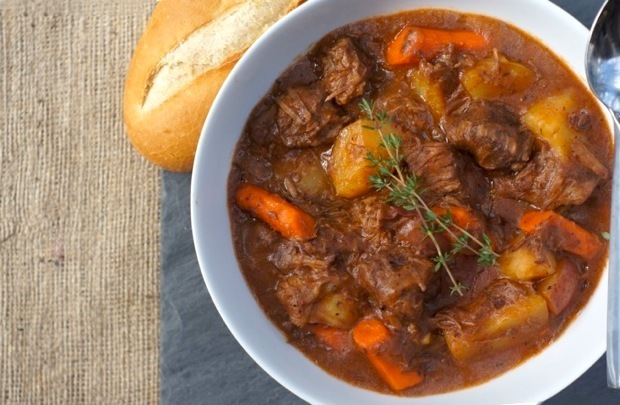 (which I love since I can leave the house with out my oven being on) my husband even said “I don’t usually like beef stew but this is pretty good” great recipe!